Simple reflection on how Marx understood the nature of money as embedded in his labour theory of value in Part 1 of volume 1 of Capital leads to this conclusion. Marx’s whole explanation of the emergence of money in Chapter 2 of Capital assumes that money must be a commodity. For Marx, as commodity exchange becomes developed and people produce things specifically for exchange, socially necessary labour time comes to determine exchange values (Marx 1990: 183–184), and the real value of commodity money arises not in the process of exchange but in the human labour expended in producing it (Marx 1990: 184–185). So only if money is a special commodity that itself has a labour value can it function as a universal medium of exchange and numéraire. You couldn’t have a clearer expression of Marx’s view: money must by necessity be a produced commodity with a labour value in order to even function as money, because, in Marx’s view, all commodity exchange is founded on the fact that commodities (including money) are made commensurable by having quantitative labour values. “Money, like every other commodity, cannot express the magnitude of its value except relatively in other commodities. This value is determined by the labour-time required for its production, and is expressed by the quantity of any other commodity that costs the same amount of labour-time. Such quantitative determination of its relative value takes place at the source of its production by means of barter. When it steps into circulation as money, its value is already given. In the last decades of the 17th century it had already been shown that money is a commodity, but this step marks only the infancy of the analysis. The difficulty lies, not in comprehending that money is a commodity, but in discovering how, why and by what means a commodity becomes money.” (Marx 1906: 104). But in the modern world virtually all commodities exchange for fiat money, which is very clearly not a reproducible commodity with a labour value in Marx’s sense. You cannot exchange a commodity for something with no labour value (that is, fiat money) and maintain Marx’s orthodox labour theory of value, for commodities exchange against a thing with no labour value in the conventional sense. Fiat money is not produced by capitalists by hiring labour and paying wages in return for some quantity of abstract socially necessary labour time. Is it possible to argue that central banks hire workers to produce fiat money with an abstract socially necessary labour time that explains fiat money’s exchange value? This will not save Marx: it is simply not possible to save the labour theory of value this way. Fiat money – the high-powered money of modern economies – can be created at will from nothing by central bank employees and theoretically in whatever quantities are needed. Such fiat money can be created at will simply by typing key strokes into a computer, and the amount of labour needed to create $1 of fiat money is hardly different from that needed to create $1 million or $100 billion (namely, a few extra key strokes). Yet obviously one dollar of high-powered money and $1 million buy commodities with vastly different quantities of abstract socially necessary labour time in Marx’s sense of this concept. You cannot explain the exchange value of fiat money by appealing to the abstract socially necessary labour time needed to create it. The labour theory of value as an explanation of modern prices cannot even get off the ground unless money is a produced commodity with a labour value, but, quite clearly, we live in a monetary economy where virtually all exchanges occur by exchanging fiat money for commodities, and fiat money has no labour value in Marx’s sense. In our world of fiat money, Marx’s labour theory of value – as presented in volume 1 of Capital – is intellectually bankrupt. Could it be salvaged? It might be salvaged, but only with radical revisions, such as giving up the view that money needs to be a commodity. Marx might, for example, argue that money need not be a commodity at all but could still be used as a unit of account to measure and price socially necessary labour time in the way I have sketched here. (4) the problem that surplus labour value (if that concept could even be adequately defended) would not really explain money profits, since money profits can exist in a slave-based economy and very probably even in an economy where machines did most of the work. If you accept the chartalist view that fiat money has some value because of taxation, then fiat money has value because people have to perform a certain amount of labour in order to obtain it.
" then fiat money has value because people have to perform a certain amount of labour in order to obtain it." It has value because you must by law pay your taxes in it. But if you are a rentier or owner of capital assets (real or financial) you have an income that doesn't require any labour. I do not see how this salvages the LTV as expounded in Capital. The person who pays the tax is not necessarily the same person who performs the labour. But a tax is ultimately a demand by the government that a certain amount of labour be performed. As a simple example the government says that everyone has to pay a head tax with fiat money that only the government can create. In order to obtain this money, people havé to perform a certain amount of labour. Well, they would have to obtain the fiat money. But that does not entail that everyone has to work to get it. You can sell assets. Call in debts, etc. There's a difference between the view that money has value because of taxation and money *can be made* to have value because of taxation. It's the difference between necessary and sufficient. A subtle point perhaps, but one people often struggle to get. Government can impose a minimum value on a voucher if it can maintain sufficient power to collect the tax across a set of people. Vouchers created out of thin air can end up having value all by themselves for no apparent reason and by reason of social power. The old mine owner paid in tokens that were required to rent to mine cottages the workers lived in. Fail to pay/work and you were thrown out not the mercy of whatever poor relief there was in the parish. Properly speaking, it has use-value for this reason. The example of the rentier and the person with the large portfolio are both examples of people whose income comes as a result of ownership rather than production, as a result of the vagaries of private property relations. So, how would you say the above damages Marx's theory? The original claim was that " fiat money has value because people have to perform a certain amount of labour in order to obtain it." No. It can acquire exchange value because people need it to pay taxes. None of it properly addresses my points. This is a ridiculous attempt by people emotionally committed to defending Marx to say anything to defend him. If you were intellectually honest, you would admit the way Marx presents the LTV in Capital in relation to money would require radical revision to even get off the ground. No. It can acquire exchange value because people need it to pay taxes. Being needed makes it a use-value, because it becomes an object of utility. You can argue that this leads to exchange value independently of value (a perfectly fine thing to argue!) but be aware that this requires additional propositions, and is by no means implied in being a use-value. What points remain unaddressed? There's nothing in your post that I haven't either addressed here or in previous posts' comments. And I have no commitment to defending Marx. I've even offered to disown him outright if it'd help deal with your emotional baggage and discuss the ideas (and their modern evolutions) on their own merits. Not only have I admitted this possibility, but I've also admitted other possibilities, as well. Of the two of us, you seem quite a bit more closed minded on this matter. --A) It situates fiat money within a particular analytical category that is distinct from money in only fulfilling some of its roles. --B) The theory must be modified, and a number of modern scholars have done exactly this. 2) Commodity money is not a logical necessity but a historical contingency of the time and context in which Marx wrote. There are scholars in all three camps. You appear to land in one of those spots in particular, whereas I find plausible arguments in all three of those endpoints. Intellectual honesty, if that is something you are finally concerning yourself with, would here call for a) examining different positions before coming down definitively, and b) checking your bizarre insistence that any of those three positions "disprove" the value theory. The fact that you land in 1B and yet ignore subsequent reformulations specifically along the lines you've demanded suggests either ignorance or intellectual dishonesty. And I figure I can rule out ignorance, since I've mentioned this aspect of the modern literature before. Ironically, this also means you're being quite a lot more dogmatic about Marx than anyone else here; for you, his theory stands or falls on his own words, and no subsequent modifications can possibly improve (or, to your mind, "save") it. That's a fascinating position, but I doubt you'll find many people who'll join you in holding it. "Not only have I admitted this possibility,"
So, wait, you actually admit that the LTV as presented by Marx needs radical revisions?! "Admit"?! I'm the one trying to get you to notice the modern literature! You wouldn't be the least bit surprised right now if you'd been reading what I've been writing over the past few months. You appear to read one or two sentences for every twenty I write. Maybe I just need to make shorter posts, to force you to take notice. my point was that taxation is ultimately a demand that a certain amount of labour be performed. The person who performs this labour is not necessarily the one who pays the tax. For the government or state to exist and to do the various things it does, labour has to be performed. To pay for that labour the government can issue fiat money tokens, which can then be used to pay tax. So we can say that taxation pays for the labour the government needs to be performed. In other words, when the government imposes a tax it is saying that a certain amount of labour has to be performed. as I understand it, according to Marx's theory, price is only equal to value (or labour value) in supply/demand equilibrium (with an average organic composition of capital). As such, if you have a monopoly then price can potentially perpetually exceed value. Well, government is a monopoly, and it effectively has a money monopoly. As such the price of money, i.e. what it buys in the market, can be above its fundamental labour value. LK: "The original claim was that " fiat money has value because people have to perform a certain amount of labour in order to obtain it." No. It can acquire exchange value because people need it to pay taxes." There is a reason why the MMT bunch advocate Job Guarantee, and they are against Universal Basic Income. "Sorry, folks, but we need an anchor to the currency. It is only worth what you need to do to obtain it. As your wise mom told you long ago. If money grew on trees, it would be worthless. A BIG payment to everyone is essentially the same thing as letting people rake a pile of leaves off the lawn to go buy Beemers. Will the price of a BMW rise? You betcha. - See more at: http://www.economonitor.com/lrwray/2013/07/09/how-big-is-big-enough-would-the-basic-income-guarantee-satisfy-the-unemployed/#sthash.bbnYhtqy.dpuf "
You should have asked if fiat money might not just mean money itself has been destroyed by capitalism. Capital hates money even though it begins and ends with money. Now what happens when capital hates the thing that posits it beginning and ending? How does it abolish the thing without abolishing itself? The solution to the riddle of fiat money is that it is the abolition of money within the money form itself. Fiat money is in reality the money form stripped of its real material content. Fiat money prefigures the actual abolition of money itself. Beside a class that is no longer a class in historical materialism, we have money that is no longer money -- and both products of modern society. These two suggest the existence of something that has no expression in post-Keynesian economics: Labor that no longer produces anything. Only labor theory -- specifically Marx's labor theory -- predicts labor that produces nothing, i.e., labor for which fiat money is the only real expression of the value of its product. I said it **might** be overcome, but note that even a radically revised LTV would still face the severe problems (1) to (4) at the end of the post. As for slave economy discussion, you seem not to understand that I do not find any counter- arguments convincing. If I may take a different tack: Exactly why don't you find the counter-arguments convincing? You cannot exchange a commodity for something with no labour value (that is, fiat money) and maintain Marx’s orthodox labour theory of value, for commodities exchange against a thing with no labour value in the conventional sense. That's wrong; Marx himself gives examples of things with no value that nevertheless have exchange value, and exchange itself is not predicated on value. This paper will hopefully clarify the issue of exactly what "value" is trying to describe, since so far I've had no luck phrasing things in such a way that you find helpful. No, it is right. You can't maintain the LTV in the way Marx defends it if things exchange for fiat money. Marx's whole chain of argument is destroyed. When he speaks of things with no value fetching a "imaginary price-form" he means uncultivated land, conscience, honour, etc. None of this changes the fact his theory requires money to be a commodity. You respond "no, [P] is right," and then quote one of the passages I was referring to in which Marx says [¬P]. Actually I think I may have flipped the signs, there, since I got distracted and now I can't review what I just typed. But hopefully my meaning is clear, that you can't cite something that says the opposite of what you're saying as proof of what you're saying (unless you explicitly admit the assumption that the source is wrong). It is because all commodities, as values, are realised human labour, and therefore commensurable, that their values can be measured by one and the same special commodity, and the latter be converted into the common measure of their values, i.e., into money. Money as a measure of value, is the phenomenal form that must of necessity be assumed by that measure of value which is immanent in commodities, labour-time.” (Marx 1906: 106). It is quite clear what Marx is arguing and what he theory is: money must of necessity be a produced commodity. If money is not and pure fiat money, it is obvious to any rational person that Marx's arguments fail. I am correct: you can't maintain the LTV in the way Marx defends it in Capital if things exchange for fiat money. The theory would need radical revision. I getting very tired of your Marxist idiocy, hedlund. You're flapping your arms like crazy, but you're not making a breeze. 2) Commodity money is not a logical necessity but a historical contingency of the time and context in which Marx wrote." Only in 1B does Marx's theory "fail," yet subsequent theorists have adjusted it to resolve this. One can find examples of similar things happening in literally any science, and science is something I, unlike you, take extremely seriously. I'm getting very frustrated of your ideology-blinded dogmatism. Maybe you should take a break from reading Marx and go read some stuff on the history and philosophy of science. You'd really stand to benefit from it. How do you respond to the point that the MELT remains algebraically identical whether or not it has a commodity basis? You've avoided this point, but I'd like a response. Thanks. (1). (b) admits I am right. (2) is effectively an admission I am right, despite your nonsense . I have no idea what (1). (a) even means. It is incoherent rubbish. If you agree with the "subsequent theorists [sc. who] have adjusted it to resolve this", you are effectively admitting I am right. You have nothing further to add or contribute to this thread. If the MELT admits that fiat money can measure labour value, it does little except admit that my argument that Marx's original LTV is badly flawed and needs radical revision. But that is NOT what the Temporal Single System Interpretation Marxists seem to be arguing. Their view is that Marx himself held the TSSI, which is clearly garbage and utterly false. Yes. MELT is entirely anti-labor theory of value. Marxists cannot have it both ways: Either Marx was right and the fiat dollar is not money, or MMT is right and labor theory of value is dead. Fiat dollars are not money and cannot be money. "Fiat dollars are not money and cannot be money." How do you explain these facts? Also, if one takes the view that fiat money is not money, then Marx's view that the circuit C-M-C in capitalism involves exchange of commodity value for money commodity value etc. is false. It would follow C-M-C no longer takes place any more. Yet it does. Just to be precise: In labor theory, money serves those functions. Fiat only serves as a token -- a placeholder -- for money in circulation. As to you argument, "It would follow C-M-C no longer takes place any more", you are entirely correct. Absolutely dead on target. This is a prediction that Marx explicitly makes in his theory: the collapse of production on the basis of exchange value. Although capital is merely a form of commodity production, Marx held it was plunging toward a crisis in which exchange value could no longer serve as the basis for production. Grossman reiterated this prediction in his own work (1929), when he predicted eventually labor power would have to be sold below its value. Your grasp of labor theory is not defective, just your conclusion. "Fiat only serves as a token -- a placeholder -- for money in circulation." But there is no commodity money in circulation any more. Please explain this point. In labor theory there was, in theory, never any commodity money in circulation. Even when commodity money in the form of coins served in exchange, the weight of the coins often did not reflect the face value -- the coin itself was only a token of gold, a token of itself as a definite weight of gold denominated in its face value. So long as the coin remained in circulation, this did not pose a problem. But once it falls out of circulation, the contradiction between its actual value (measured in some definite weight) and its face value is expressed. According to Marx, it is this token-like character that made it possible for coins to be replaced by paper -- but, and this is crucial to his argument, only so long as the paper remains in circulation. Once the scrip drops out of circulation, it is just worthless paper possessing no value at all. Ending the gold standard had no effect on the functions of paper currency, but abolished money itself, i.e., the capacity of money to fall out of circulation and become actual money -- a hoard of gold. This was because during the Great Depression this hoard, once it fell out of circulation, could not become capital again, i.e., refused to reenter circulation as capital, as means to purchase labor power. And this is because, as I stated previously, the commodity, labor power, had to be sold below its value if production was to remain profitable. This new requirement violated the premises of production on the basis of exchange value. Gold can only express the value of any commodity. It is not possible for gold to function in any other way than this. To buy labor power below its value and continue production for profit, the exchange value of commodities had to be ignored. I am sorry. The explanation here is necessarily condensed and requires a more complete elaboration. At some point i will attempt to do this in a way that reflects the gravity of your own argument. I'm gonna have to say Jehu has the game down. Fiat money is a cultural habit. It is necessary not because of its value, but because of the impossibility of satisfying all participants in any other way ppl know of. That necessity gives it the ability to carry value. Our other cultural habits such as social insecurity, fears of not living up to expectations, and other social forces distract us from attacking the lack of value in fiat. Fiat money is a hack. It's a hack we accept. Marx said value comes from labor. Fiat has no value other than the lie that we all accept it as a balance for the hidden self-abuse we unleash on each other. Fiat lives on borrowed momentum. So anything Marx says must be true? This is the mentality of a religious cult. It has nothing to do with Marx. It has to do with the fact that fiat is not even wrong. It is a globally accepted farce powered by abuses we accept as natural and fair. If somehow people were to stop hating themselves and passing the hate on to anyone who walks by, fiat value would nose dive without any direct action against it. lol... you sound like an Austrian or libertarian gold bug. If we stop the hate, the hate machine slows down. That leaves room for spending time in other ways. Like not buying stuff we don't need. The viability of fiat depends on delaying an honest calculation of its worth both in use value and exchange value. One can't easily merge theories of absolute "value" or economy with prior axioms, such as biological evolution, thermodynamics or quantum dynamics. If one eventually has to go, or be substantially modified, you know which one it will be. By analogy, the ~40Trillion eventually have no higher theory of value other than survival of the aggregate. Is there any reason to suggest that human individuals have any higher theory of value than survival of THEIR aggregate, including their children, grandchilren & on out to the 7th generation yet unborn? Does a Marxist labour theory of value have any validity, not only when there is fiat money but even when gold and silver commodities were used as money ? If commodities long run normal or natural prices, on average, exchange according to the socially necessary labour time embodied in them then would we not expect that when there are constant returns to scale in some industries,this would be true ,but when there are increasing returns to scale in others, then their long run prices would be below their labour values and in those industries where there are decreasing returns to scale, long run prices would be above their labour values. Shouldn't Marxists have to show empirically that on average long run prices are equal to the socially necessary labour time embodied in commodites? To say , as some do, that it is an accounting identity seems to me to imply that the some of the deviations of natural prices from their labour values is zero. But is this true empirically? The problem, seems to me, when fiat money is adopted for some of the reasons you suggest. to be exacerbated . I know i am not very knowledgeable on Marx and I respect those that are. I am just not sure that I really understand Marxists or Marx. Many thanks for your valuable insights on Marx and your critiques. I respect Hedlund but I am not sure I grasp what he is really driving at, at times. I do not think it had any validity even under the gold standard, or in pre-industrial societies. "Shouldn't Marxists have to show empirically that on average long run prices are equal to the socially necessary labour time embodied in commodites? " No, those prices (we generally use the term "prices of production") are not held to be exactly equal to the corresponding values (or at least not necessarily so). And the transformation problem is not an internal inconsistency but rather an external inconsistency, stemming from a failure to distinguish between the value of inputs and the value of money capital advanced to acquire them. Quick example: Assume for a moment prices equal values. If a capitalist buys a machine for $2,000, and then the value of that machine falls to $1,000 before she has the chance to use it in production, the profit generated by the output will still be based on $2,000 put forward to acquire the machine. That's the investment on which the returns are judged. This does not change, even though the output will be less valuable due to the fall in input value. If you attempt to judge the rate of profit on the basis of $1,000 instead of $2,000, you run into "the transformation problem," since the figures no longer add up. As such, it is not possible to "solve the transformation problem" because the problem is the result of an error — one some Marxists have made and others have not. I respect Hedlund but I am not sure I grasp what he is really driving at, at times. I appreciate this, and I apologize if I am not always as clear as I could be. I make no claims of being a great communicator, but I do strive to improve. "Shouldn't Marxists have to show empirically that on average long run prices are equal to the socially necessary labour time embodied in commodites?" No. Because, in labor theory, average long run prices are not equal to the socially necessary labor time embodied in commodities and Marx never said they were. What he said is that in SIMPLE COMMODITY PRODUCTION average long run prices are equal to their socially necessary labor times. We do not occupy an economic spce dominated by SIMPLE commodity production, but by CAPITALIST commodity production. Prices in this economic space are in fact dominated by two irreconcilable factors: socially necessary labor time and the average rate of profit. Prices in capitalist commodity production are not at all as simple as they are in simple commodity production as the so-called 'transformation problem' demonstrates. The only basis on which simple commodity prices could equal capitalist commodity prices is if profit (s) = 0 or wages (v) = 0. The transformation problem has never been solved because it cannot be solved. It is a contradiction at the heart of the capitalist mode of production that drives it to collapse. "The transformation problem has never been solved because it cannot be solved. It is a contradiction at the heart of the capitalist mode of production that drives it to collapse." I am not sure that I understand the last part of this paragraph. (1) Granted that under the capitalist mode of production we have C-M-C for exchange of commodities and M1-C-M2 where C is commodities, M is money, Mi is money Capital used to to purchase the factor inputs(means of production and labour power). It is in the process of production that surplus value is created. M2 is money capital realised in exchange and if capitalists' profit expectations are realised, then M2 will be larger than M1. Why must the failure of the transformation problem lead to the eventual collapse of capitalism? I see no empirical evidence which supports the view that the contradiction "at the heart of the capitalist mode of production drives it to collapse".. The long run tendency of the rate of profit to fall does not seem to me to have any validity. And if the transformation problem is not solvable under expanded reproduction, why should we pay any attention to the labour theory of value and the theory of surplus value? First, capitalism is a form of commodity production which moves according to the law of value, in which the prices of commodities are expressions of their values. Second, capital is a specific form of commodity production which aims not at production of values, but production of surplus value. Hence it also moves according to the law of the average rate of profit. As any objective person will agree, the second law conflicts with the first law. This conflict unfolds in such a way that the relation of values and prices begins to actually break down. At a certain point in the development of production prices can no longer express the values of commodities. I would argue, we have already passed this point in the development of capitalism, which was signaled by the collapse of the gold standard beginning in the 1930s and culminating in 1971. The empirical evidence for the law of value is not missing, it is being ignored or, better still, being explained away by both Marxist and bourgeois economists who argue money became an impediment to capitalist growth in the 1930s. However, in the Grundrisse, Marx predicted this event and called it the collapse of production on the basis of exchange value; which is the collapse of the law of the simple commodity production relation between values and prices -- the law of value itself. Now here is the thing: capitalism itself is only a form of commodity production but it has already violated the 'rules' of simple commodity production. Which means, it has already violated the premises of its own operation. Moreover, the law of an average rate of profit is itself only the expression of the law of value under conditions of capitalistic commodity production. If the law of value has broken down, this law must have broken down as well. To put this another way, if the price of labor power (wages) no longer expresses the value of the commodity, the sum of the profits of capital no longer express the sum of surplus value. This condition, however, is incompatible with the capitalistic mode of production. For it to arise, there has to be some intervention external to the production of commodities. Such intervention is absolutely necessary to sustain capitalistic accumulation and it is to be found in state management of the national capital. The aim of this intervention is nothing but the attempt to forcibly reduce wages below the value of labor power and thus to increase profits above the sum of the produced surplus value. Marxist and bourgeois economists not only ignore the collapse of the gold standard, they ignore why it was replaced by inconvertible state fiat. The capitalist system will continue so long as firms are making profits and the workers don't look like revolting against the system in any significant way, sometime soon. It may be true that the distribution of income has become more unequal over the last 30-40 years, but workers' standards of living in most Western democracies have not deteriorated to any extent that it is likely to cause a revolt by workers. The global financial crises was very serious but the system has not yet collapsed. I don't see any necessary tendency for the long rate of profit to fall in capitalist mixed economies. If in Marxian jargon, P = S/(C+V) where P is the rate of profit, S is Surplus Value, C is the organic composition of Capital and V is variable Capital, the P = (S/V) / (C/V +1). 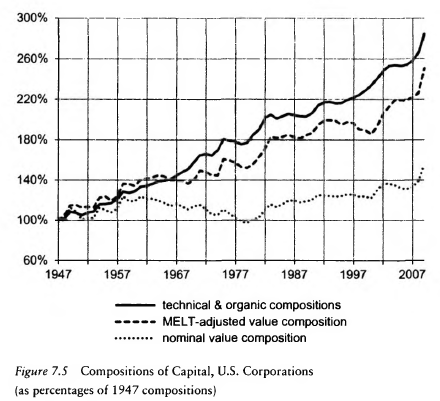 An increase in the organic composition of Capital will lower the rate of profit provided the rate of Surplus Value (S/V) does not offset it. S/V might increase because of increasing "exploitation" of workers, but it might rise because the increase in C/V also, at the same time, raises the productivity of labour. Let Y = W+Z = wN+zK where , Y= real GDP, W = real wages and Salaries and Z = real Gross Operating Surplus. Let w = the real wage rate, N be the level of employment, z be the profit rate and K the stock of Capital equipment. Then z = (Y/N )- w) / (K/N) where Y/N is the productivity of labour and K/N is the capital-labour ratio. So an increase in the Capital/Labour ratio will not lower the rate of profit if the distribution of income moves in favour of the capitalist class and this can occur if the increase in the productivity of labour rises faster than the real wage rate and offsets the rise in K/N in the denominator. What I don't understand is why the long run rate of profit should have a tendency to fall under capitalism as Marx claimed. After all, we have Keynes to thank for saving the capitalist system after the Great Depression of the 30's. Perhaps more economists should get back to Keynes more than they have (after the recent Global Financial crisis) and stop worrying about austerity programs. I am confused about how the labour theory of vale is supported from the empirical evidence as you claim, but I will try to reflect and learn from your arguments. I just don't see Marx as necessary for understanding the economy today, though he has many valuable insights which I think have been taken up by Kaleckians. Many thanks for your response. I just don't have the knowledge of Marx that you and Hedlund have. If a capitalist pays $200,0000 for a new machine then the expected rate of profit is based on this initial expenditure when compared with the discounted expected net cash flows over the life of the asset (including any scrap value obtained by the capitalist for the sale of the asset at the end of the project). If the discounted net cash flows (expected revenues minus expected operating costs discounted at an appropriate discount rate) does not exceed the initial capital cost, the capitalist will not undertake the project. Once the initial capital cost of the asset purchased has been incurred, it is a sunk cost, So it doesn't matter if the value of the initial capital has fallen as you point out . In Marxian jargon, M1-C-M2 where M2 is expected to be greater than M1. Surplus value is created in the process of production, not in the process of exchange. However , it is realised in the process of exchange only if the demand for commodities is high enough to sell all that is produced at the anticipated market prices. So I if surplus value is not realised, how can we say that the sum of the deviations of values from prices are equal to zero. How can we say, in this situation, that on average commodites will exchange at their socially necessary labour time. If I am understanding you, am i correct to believe that you maintain that the LTV is applicable (on average) only for prices of production at the value of inputs and not necessarily at the vale of outputs? I am still confused and cannot see how the LTV is not 'metaphysics' rather than economic science. After all, some Marxists have jettisoned the LTV long ago. What do you think of Ian Steedman's book "Marx after Sraffa"? So I if surplus value is not realised, how can we say that the sum of the deviations of values from prices are equal to zero. It's important to note that we're discussing realized prices, not notional/ideal prices. Excess unsold inventory effectively halts the circulation process at C' (along the further expanded formula of M-C-P-C'-M'), and as such neither price nor value is yet realized. It's explicitly specified that a product must sell above its cost-price (thereby realizing some profit) to realize surplus value. In other words, there isn't even a p or an s yet, let alone divergent ones. The analysis is applicable to actual market prices just as well as prices of production. At the day's end, the simple materialist premise that one cannot consume a commodity that has not been produced is never altered. In what way does it strike you as "metaphysical" (and, if I may ask, how are you defining the term)? What do you think of Ian Steedman's book "Marx after Sraffa"? It's been responded to extensively over decades of rousing -- at times downright unpleasant -- debate. Interesting paper. But it overlooks the most important argument against sraffians: In the corn model, there are not one, but two commodities -- corn and labor power. Corn in the model is a commodity money employed to purchase labor power. What the sraffians have done is reduce all other commodities in a capitalist economy to their simplest form -- corn-money. This corn-money is then used to buy labor power. Thanks for the reference. I'll come over and look at it on the site you mention. Interesting paper. But it overlooks the most important argument against sraffians: In the corn model, there are not one, but two commodities -- corn and labor power. Corn in the model is a commodity money employed to purchase labor power. I had always assumed the existence of the wage to imply that labor power's existence was assumed, even if not accorded the status of "commodity" in the language of the model (maybe it would be better termed a "single-output" or "single-industry" model?). I suspect you're making more than just a semantic point, and in that case I think we may be making the same argument using different language. If simultaneous valuation winds up holding the unit-value of output constant where it should be falling (in consideration of rising productivity of the same labor time), then the classic corn model stealthily discards the very labor relation it purports to examine. Is that the consequence you're driving at? A two commodity model in which a commodity is used to purchase labor power and labor power produces a surplus in the form of this other commodity is, by definition, already a complete description of the capitalist mode of production. It is not possible to recognize that labor power is a commodity in the corn model, without, at the same time, recognizing that corn is not just another commodity, but the money-commodity in the model. The Sraffians cannot reduce capitalistic production to such a simplified form that they escape labor power and money. The idea the corn model is a money-less economy is not valid and can be discarded, since it adds nothing to the debate on the transformation problem. In any case, "v", i.e. wages, can never equal "v+s", i.e., the sum of wages plus profits, unless s= 0 or v = 0. I was using "metaphysical" in a very loose way and, perhaps, I should have used a different word. Economic models, verbal and mathematical, have assumptions, definitions, a set of behavioral equations, and logical implications (conditional predictions). All models are abstractions from reality to some extent. But models are appropriate where they are subject to empirical tests and the tests do not refute the hypothesis being tested within say a 5% significance level. However, there can sometimes be more than one models that explains the data and some realism is required in the assumptions. e.g. models based on perfect competition that explain price behavior in imperfectly competitive markets, in my view, are not realistic and do not correspond to how most markets operate and MC pricing is not applicable when there is cost plus pricing. Now Marx does use the method of successive approximations so that his abstractions from reality get closer and closer as certain assumptions are relaxed. and modified. I am not sure why I should consider the LTV valid and whether it can be subject to empirical statistical tests? Perhaps, its implications can but such conditional predictions of such Marxist models reliable? What keeps worrying me about Marx's views is that he presents a theory and then looks for all the counterveiling tendencies so that I am at a loss to understand how to make conditional predictions from his assumptions and behavioral hypotheses. I am going to read your material more closely to see if I can understand it, Thanks for your response. I am not sure why I should consider the LTV valid and whether it can be subject to empirical statistical tests? Oh, sure. 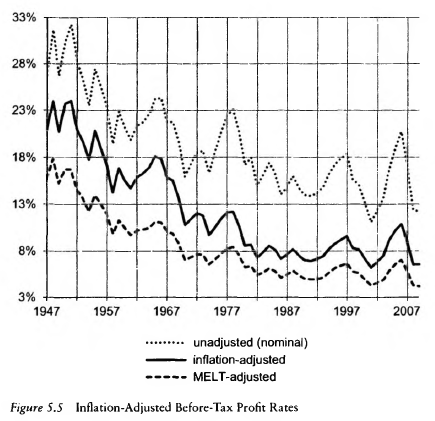 You can use time-series data to illustrate a falling rate of profit or a rising organic composition and the like (those are from Kliman's "The Failure of Capitalist Production"). There has been some very compelling recent work in the field of international trade, as well, building on the theories of imperialism, unequal exchange, et al (see, e.g., Zak Cope's "Divided World, Divided Class"). Perhaps, its implications can but such conditional predictions of such Marxist models reliable? What keeps worrying me about Marx's views is that he presents a theory and then looks for all the counterveiling tendencies so that I am at a loss to understand how to make conditional predictions from his assumptions and behavioral hypotheses. I can see how that might be intimidating, yeah. For what it's worth, it's usually clear that one tendency exhibits long-run dominance over its countervailing ones. For example: as you note above, you can decompose the rate of profit into the rate of surplus value and the organic composition of capital, and a rise in the former can offset a rise in the latter. However, changes to the former are bounded in ways that changes to the latter are not; there are only so many hours in a day that can become unpaid labor, and people still require sleep and sustenance. At the end of the day, you're still dividing a flow by the stock into which it feeds, and the flow can't expand without bound. In the long run, then, we can say that the countertendencies (growing rate of surplus value) cannot overcome the central tendency (the declining overall ratio). Distinctions like that are key to making sense of the overall picture.